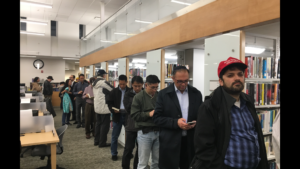 Almost 10 times as many voters cast ballots in this year’s Oct. 29 Great Neck Library election compared to last October. 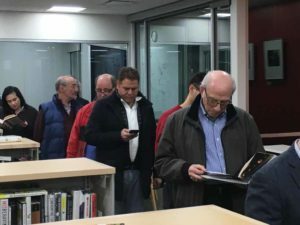 On Monday, 2,369 residents came out to help determine who would fill four Board of Trustees and three Nominating Committee seats, while only 249 voters showed up last year. 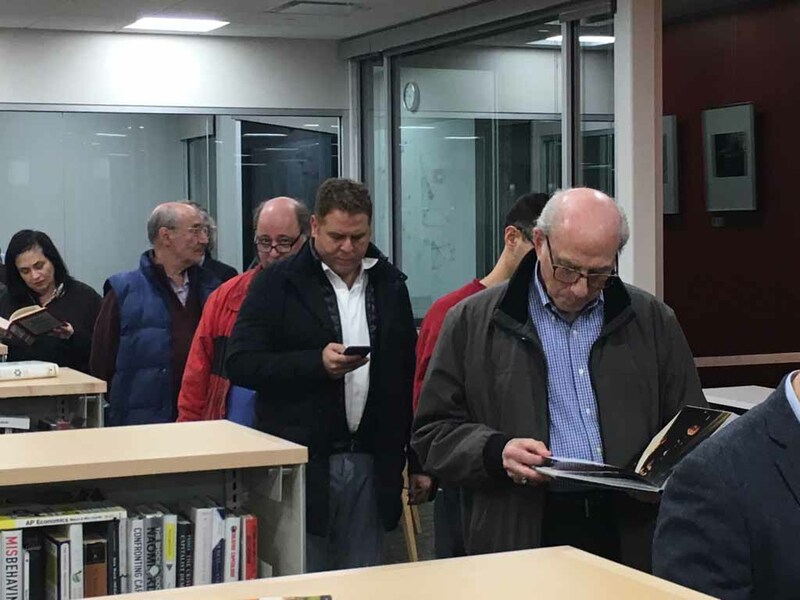 The polls closed at 10 p.m., but the libraries were still filled with voters who patiently waited on line for approximately two hours, with the last of them finally casting their ballot at around 11:30 p.m. Since the library ran out of preprinted ballots, the emergency supply had to be counted by hand. Liman Mimi Hu, Chelsea Sassouni, Scott J. Sontag and Josie Pizer were overwhelming winners for seats on the board, and all nominating committee races were uncontested. 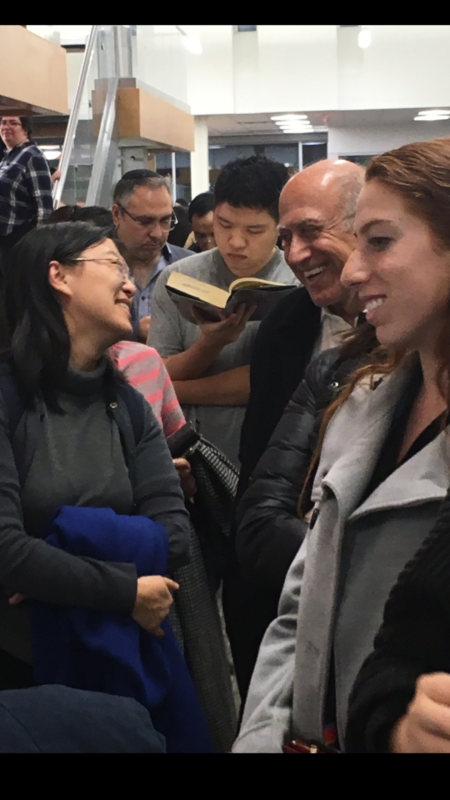 For the four-year term to fill Robert Schaufeld’s seat, Nominating Committee Candidate Hu won with 1,389 votes over write-in candidate Qiping Zhang’s 761 votes. 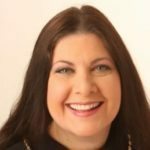 To fill the seat for the four-year term held by Joel Marcus, Independent Candidate Sassouni earned 1,195 votes, beating Nominating Committee Candidate David Zielenziger, who lost with 681 votes. The most uneventful race was to fill the remaining two-year term of Douglas Hwee in which Nominating Committee Candidate Pizer was unopposed and garnered 1,117 votes. 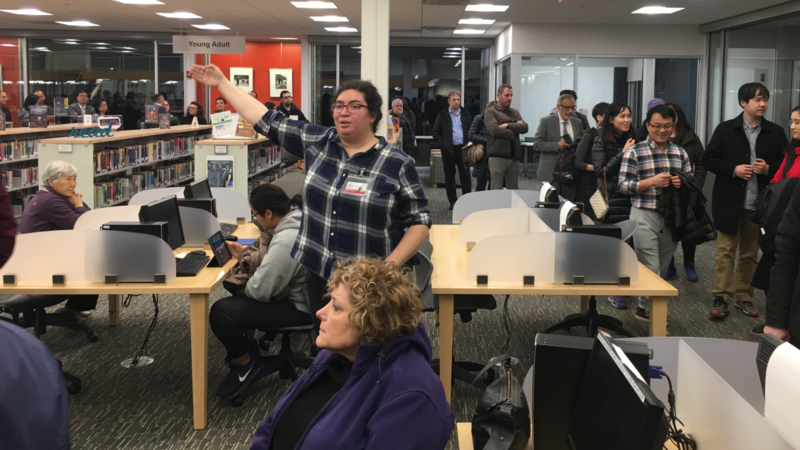 For the remaining one-year term of Francine Ferrante Krupski, Nominating Committee Candidate Sontag received 1,011 votes, while Independent Candidate and current library board president Schaufeld received just 559 votes. In the Nominating Committee races, Krupski received 1,098 votes to fill the three-year seat held by Howard Esterces, William Gens earned 1,032 votes to fill the three-year seat held by Donald Panetta and Siu Long “Alex” Au garnered 1,094 votes for Samuel Gottlieb’s two-year term. One of the most interesting aspects of this election were the undervotes, or the number of people who voted in the election but did not vote for some of the seats. In the trustee contests, anywhere from around 200 to 1,100 voters did not select a candidate. So, while the outcome of two races inspired passion, one uncontested race shows relative disinterest. 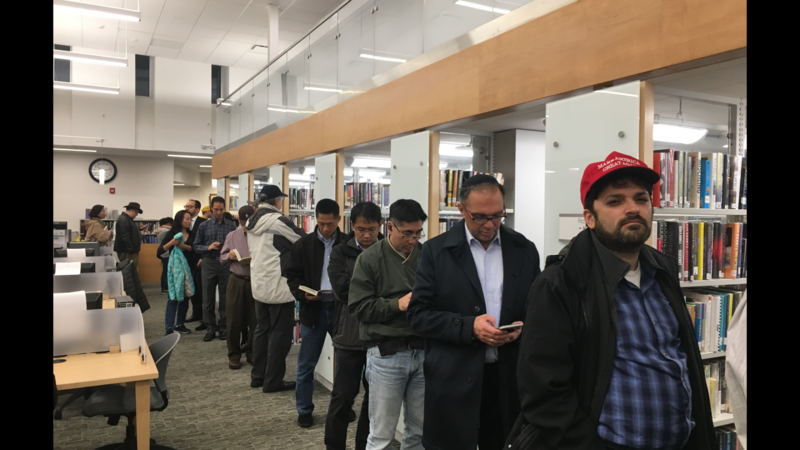 “Half of all those voters stood in long lines late into the night because they had a focused reason for voting,” remarked resident Rebecca Rosenblatt Gilliar. 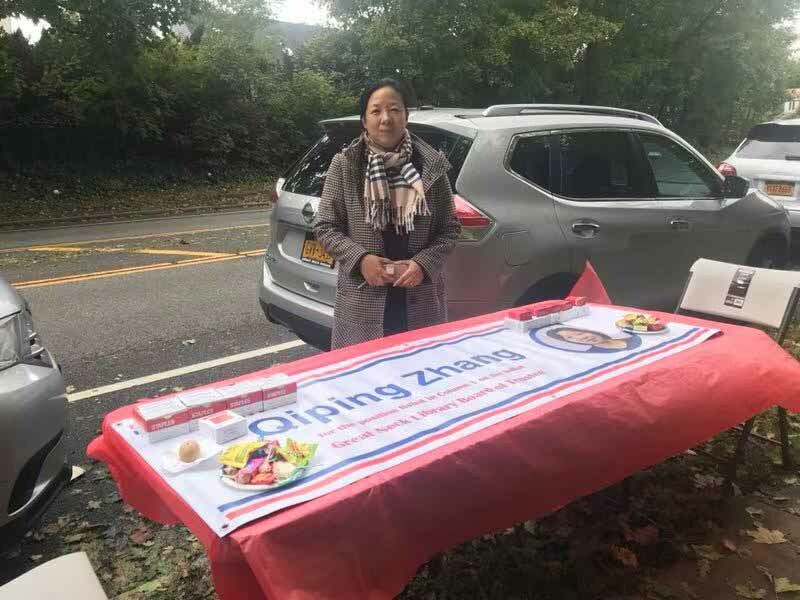 Behind-the-scenes drama ensued in Hu’s uncontested trustee race when Zhang launched a very aggressive write-in campaign in response to Hu’s defending LGBTQ rights during a conversation on the social media platform WeChat, where local residents discuss various topics in Chinese. 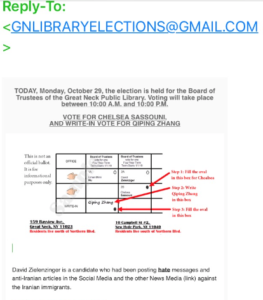 This particular issue fractured the Chinese community as Zhang, who admitted she was not selected by the Nominating Committee and did not collect the required verified signatures to become an Independent Candidate, promoted herself as someone who would bring “family values” to the library. 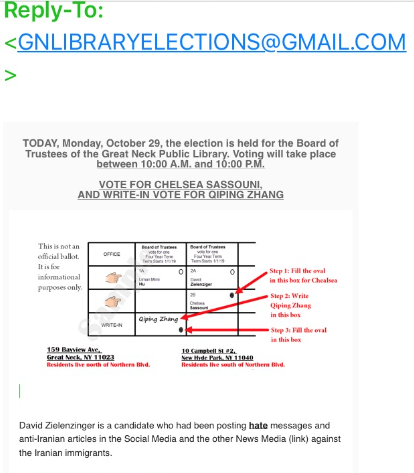 Here’s a screen shot of the sample ballot emailed to voters from the write-in candidate, which many confused residents said they thought the library was advocating. Voters complained that the write-in candidate set up tables near the library voting places, asking passersby to stop so she could hand them instructions on how to write her in. 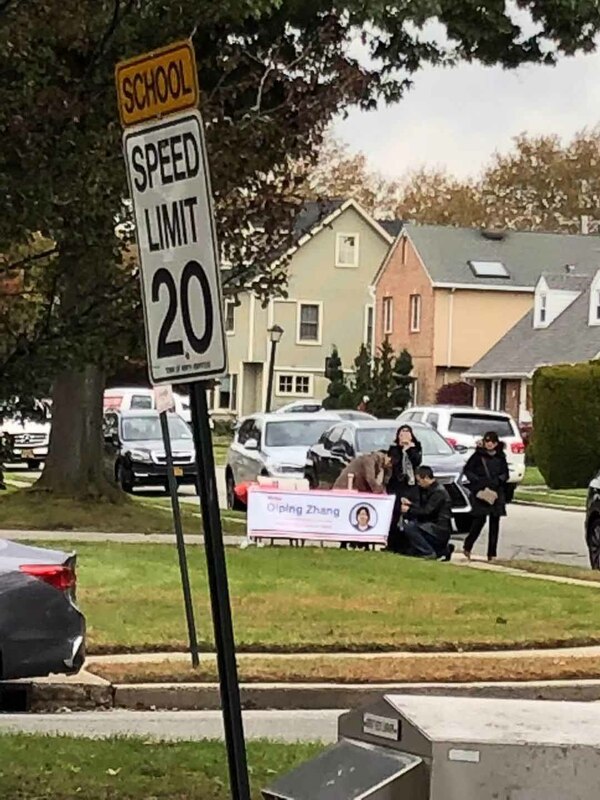 During the heated election, the write-in and other community members accused Zielenziger of being anti-Iranian and anti-Semitic. 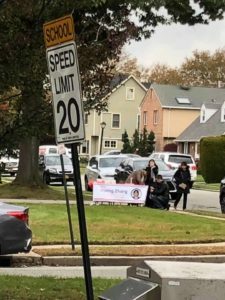 On Election Day, Nassau County police were summoned to the library after an argument ensued between a resident and Mersedeh Rofeim, the woman who was videotaped making racist and homophobic remarks to Hu while she was with her 6-year-old son at the Street Festival and AutoFest in Great Neck Plaza on Oct. 21. 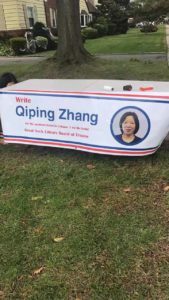 “Let’s grow out of this campaign, put all the negativity to the end and create the unity at an elevated level,” said Zhang in her concession speech. Now that the election is behind them, the trustees-elect are looking forward to focusing on the library that they love. Sassouni shared her thoughts on winning and what she hopes to accomplish.